Posted on: October 4th, 2017	by Jennifer A. In Disney Pixar COCO you can’t help but fall in love with the skeletons in the Land of Dead. The Disney Pixar COCO skeletons are colorful and lively. And while you might think all skeletons are the same, it became clear early on in watching COCO that each skeleton character was very unique. Each had their own personalities that were reflected in their clothing, facial expressions, and facepaint. 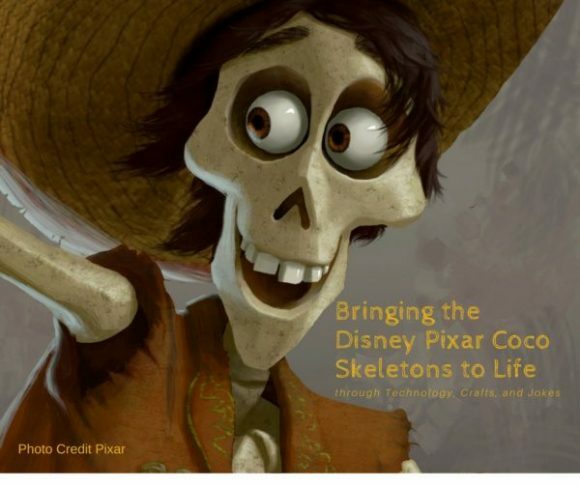 Take a look as I share some interesting details about how Pixar animators brought the COCO skeletons to life, easy skeleton crafts you can do with your kids, and funny skeleton jokes to tickle their funny bone. COCO – Concept art by John Nevarez. ©2017 Disney•Pixar. All Rights Reserved. How do you animate a skeleton? How hard do you think it might be? 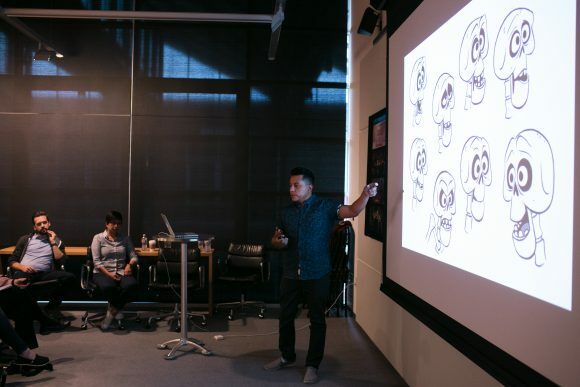 When we sat down with the team responsible for animating the Disney Pixar COCO skeletons, during the press junket, we learned that animating the skeletons in COCO was quite complex. Think about it… all skeletons look the same. However, if you are creating a movie with a cast of skeletons playing different characters each skeleton has to be unique. As a result, it took 3 years to animate all the COCO skeletons. Here are some other fascinating facts that Supervising Animator Gini Santos and the team of Pixar animators shared with us. Pixar COCO Skeletons details that will WOW you! Skeletons have never been animated before in a Disney Pixar film. The animation team studied anatomy and bones in great detail for the COCO movie. 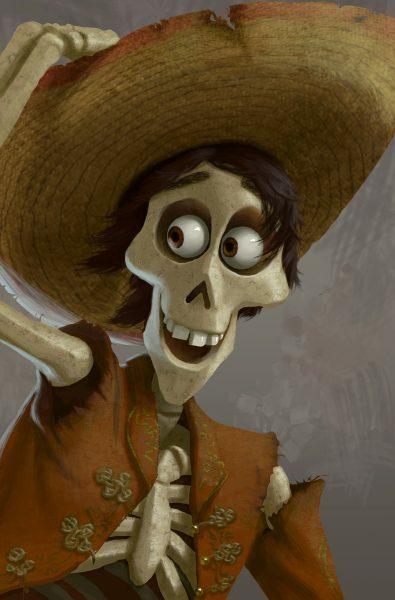 While eyes and hair do not normally remain as part of a skeleton they were added to COCO skeletons to make the skeletons more relatable and less scary. The additional facial features allowed the skeletal characters to also show emotion. COCO – Mamá Imelda concept art by Daniela Strijleva. ©2017 Disney•Pixar. All Rights Reserved. Computer 3D models were used to determine how bones move when in motion. Animators wanted to understand how far apart the bones would be while walking, running, talking, and other movements. They wanted the gaps between elbows and arm bones, knees and leg bones, and other joints to seem natural. A knee should stay in line with the leg when a skeleton walks. Jaws in a skeleton may show large gaps when a character talks. 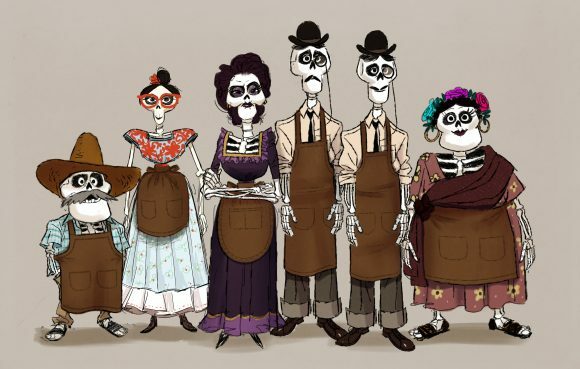 Animators had to overcome these challenges to create the COCO skeletons as relatable characters while also not taking away from the fact they are skeletons. 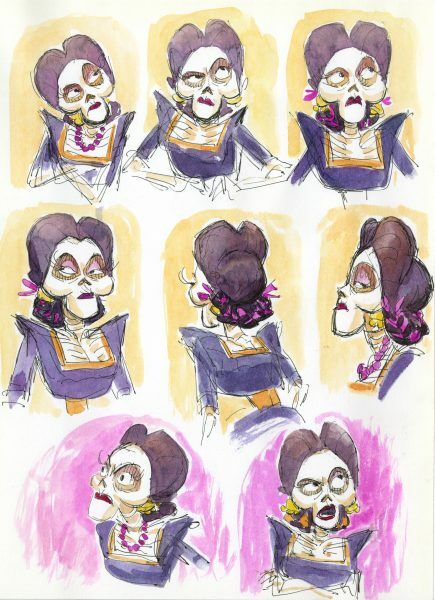 Figuring out the clothing for the COCO skeletons was one of the more time-consuming tasks in the animation of the skeletons. With the animation software, initially, the clothing worn by the COCO skeletons would get caught between the gaps in the skeletons’ bones. Simulation Technical Director Emron Grover explained how they had to create connections between bones in some areas to allow clothing to drape over the bodies correctly. COCO – Hector concept art by Shelly Wan. ©2017 Disney•Pixar. All Rights Reserved. There are 127 bones in the body and nearly 100 skeletons in the COCO movie. Character Shading artist Lead Byron Bashforth had the challenge of shading the bones to reflect the character. His team created a computer program, using human and animal bones, to shade the COCO skeletons. So much of our regular body movements are determined by our weight. Understanding how skeletons would be much lighter than a regular ‘live’ body, animators had to take the lighter weight into consideration when designing how the COCO skeletons would move. COCO – Concept art by Zaruhi Galstyan. ©2017 Disney•Pixar. All Rights Reserved. Animators also used variations in skull shape and size to differentiate between one COCO skeleton and another. With this new Disney Pixar COCO trailer you get a glimpse into how the animators worked to bring the Disney Pixar COCO skeletons to life. If learning about the Disney Pixar COCO skeletons has you interested in making some skeleton crafts for your next family movie night check out these skeleton crafts from our blogging friends. How did the skeleton know that it was going to rain? He could feel it in his bones. Why wouldn’t the skeleton go skydiving? He didn’t have the guts for it. How do you make a skeleton laugh? Tickle his funny bone. Why are skeletons always so calm? Because nothing gets under their skin. Why did the little skeleton want to quit the football team? Because his heart wasn’t in it. Why didn’t the little skeleton want to get up in the morning? He was a lazy bones. Where do teenage skeletons go to class? High skull. Why didn’t the little skeleton want to go to the dance? He had no body to go with. Why did the little skeleton do extra work? Because he wanted the bone-us points. Why do skeletons hate winter? BeaBecausee cold goes right through them! What did the skeleton say when another skeleton told a lie? You can’t fool me, I can see right through you! What did the skeleton say while riding his motorcycle? I’m bone to be wild! What type of art do skeletons like? Skulltures! Please note Jersey Family Fun does participate in affiliate programs. If you use our link to purchase movie tickets or products, a small commission does go to Jersey Family Fun to support our free services to readers, but this does not affect your price.